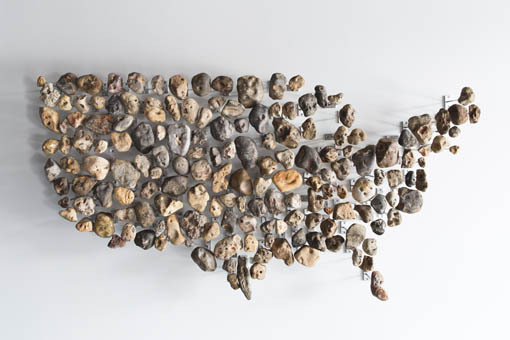 Bemis Center for Contemporary Arts is proud to announce an exhibition of new works and projects by Mel Ziegler. 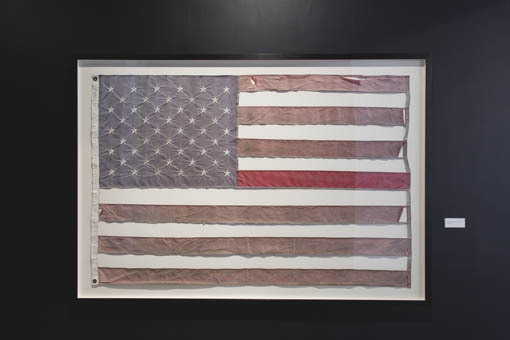 The exhibition brings together multiple recent works that occupy a continuum of cultural hierarchies and connect subjects including the American flag, guns, agricultural landscapes and rural life. In the broadest sense, Ziegler's work asserts the value of rural identities and aesthetics and aims to locate authentic spaces within the increasingly fragmented American experience. During his extensive travels throughout the United States, Ziegler has replaced decayed American flags at civic locations — city halls, museums and schools — with new flags. 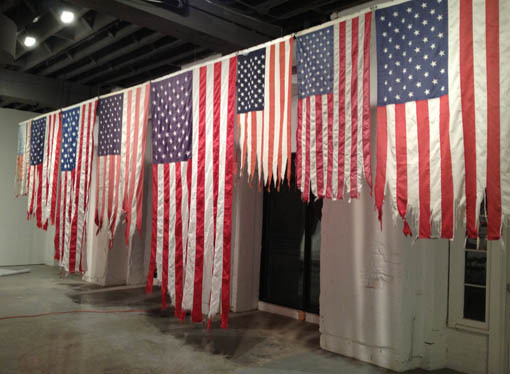 The distressed flags form a work that spans the geography of our union, and represents the spectrum of durability of our allegiance. Another work is comprised of scores of guns produced by Ziegler’s twelve-year-old twins. 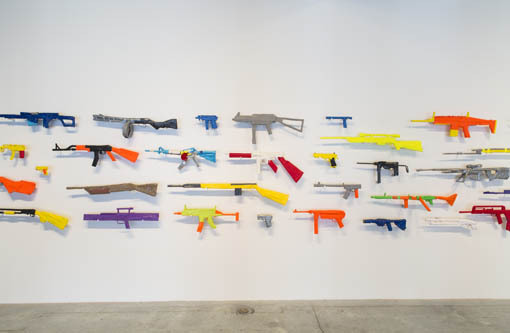 The guns are obsessively produced facsimiles, from duct tape, foil and paper, and referenced from images culled from the Internet. In total, the work speaks to the unique, and remarkably fraught relationship that our country has to firearms. 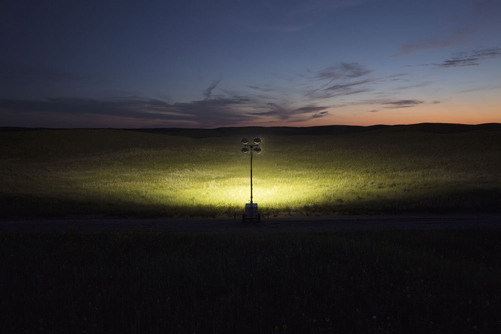 The cornerstone of the exhibition is an ongoing work in which Ziegler has explored the expansive agrarian landscapes of the middle west, and documented a series of ephemeral events in the landscape. 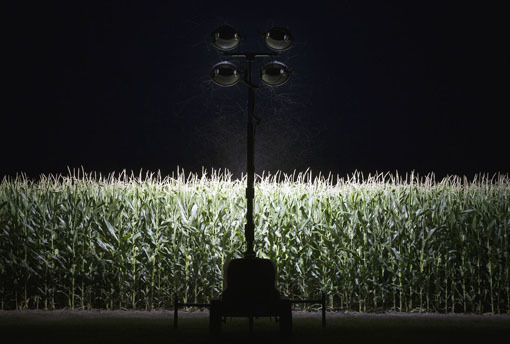 Beginning in 2012, in response to the historic drought throughout the Midwest, Ziegler traveled the region, met with farmers and ranchers and staged lighting events on their lands. 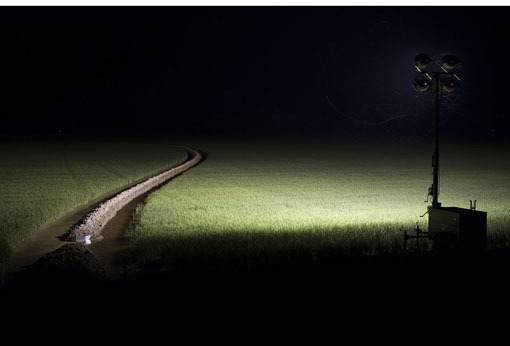 During these events, Ziegler would bring a mobile lighting rig into the farmland, and monumentalize their crops. In the last year, this effort has expanded and focused on the Sand Hills of northwestern Nebraska. 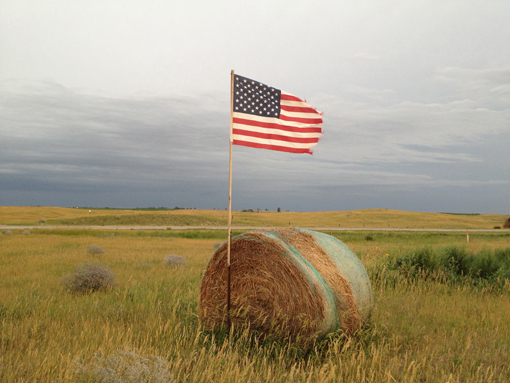 As the project evolved, Ziegler directly engaged with ranchers throughout the Sand Hills, and is building a project that illustrates the tremendous social bond that exists across incredibly dispersed communities. In Ziegler’s work, the Sand Hills are a remarkable protagonist — a surreal and otherworldly landscape of sand dunes, ideal grazing territory and a charged locus of ownership politics and the depleting Oglala aquifer. For Ziegler, and us, the American landscape is a place of deep distress and profound optimism. This exhibition is organized by the Bemis Center for Contemporary Arts and curated by Hesse McGraw. Widely known for his collaborative work with his late partner Kate Ericson, Ericson Ziegler was integral to the emergence of integrated practice and community engagement as vital forms of contemporary art. Ziegler is the current chair of the Department of Art at Vanderbilt University, in Nashville, Tennessee. America Starts Here, the Ericson Ziegler retrospective, was co-organized by the The Frances Young Tang Teaching Museum at Skidmore College and List Visual Arts Center at MIT and toured the country. 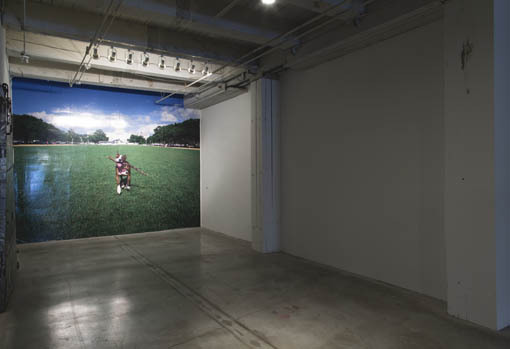 Ziegler has presented solo exhibitions at venues including Secession, Vienna; Artpace, San Antonio; and Canadian Center for Architecture, Montreal.